Sorry to keep you in suspense there. I wasn’t trying to be cruel, honest. So you’ve got your ziploc bags, pen, costumes and box? This is super easy and depending on how many costumes you have, it shouldn’t take that long. But if the thought of doing this all at once makes you cringe, then you know what to do, right? You give the job to your spouse and go watch a movie? No, silly. You get your timer! Set it for 10-15 minutes and when the timer goes off – STOP. Take a break. Then do it over again. You can do this however you’d like. Some ideas might be: by category (all pirate stuff here, all animal costumes here, etc. ); by size (baby costumes, toddler, child, adult, etc. ); or by type (weapons, teeth, hats/wigs, etc.). I prefer to keep it even simpler than that and keep all parts of a costume together. That way when I grab a costume bag, I know I’ve got all the pieces in one place. Now that they’re all sorted, it’s time to put them into the ziploc bags. The size of the bag will be determined by the size of the costume. Infant-sized costumes might fit in a quart-sized bag. Adult costumes will probably need to go in gallon or larger-sized bags. Now don’t overanalyze this part! If all you have are gallon-sized bags, put them all in gallon-sized bags. If they don’t fit in one bag, use 2 and label them accordingly. Write what the costume is and maybe even the size on the outside of the bag. A sharpie is great for this, but a ball-point pen will work just fine, too. 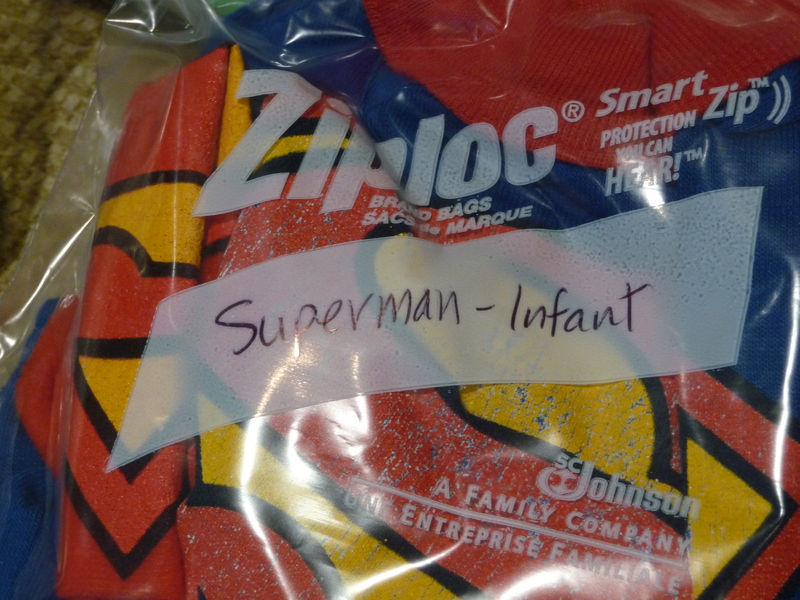 If you have a costume that is in more than one bag, you could write “Superman-adult (1 of 2)” so you know to look for the bag that reads “Superman-adult (2 of 2)”. It’s time to put them away. *sniff* I know. You can do this. Put them in the box and close the lid. You’ll be all right until next year. Halloween — it’s time to say goodbye. 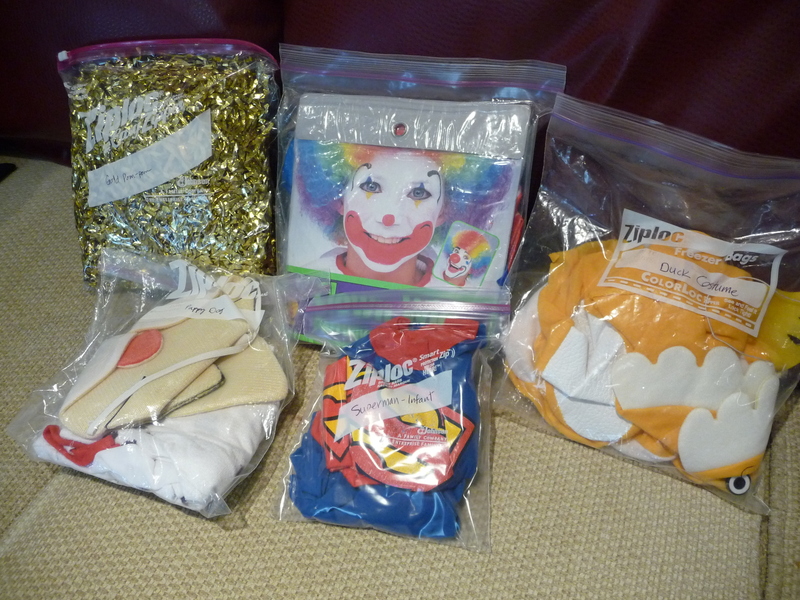 This entry was posted in Organizing and tagged costumes, halloween, organize, ziploc bags. Bookmark the permalink.